We show you how to set up and use your Android smartwatch. The latest 5.1.1 version of Android Wear has made Google's smart watch platform featured on devices such as the Moto 360 a lot easier to use on devices than previously. Rather than mixing voice commands, tasks and settings into a single menu – and hiding the apps behind the 'Start' option – the user interface has been split into three sections: apps, most recent and favourite contacts, and voice commands. The first step is updating your smartwatch to the latest version of Android Wear. Tap on the smartwatch face to bring up the menu, scroll down to Settings > About > System updates to initiate the update process. Your smartwatch will use your smartphone's Internet connection to pull the update down, and once it's ready, you can tap to open the installer. Being able to swap between watchface designs to suit your mood or fashion sense is half the fun of having a smartwatch. 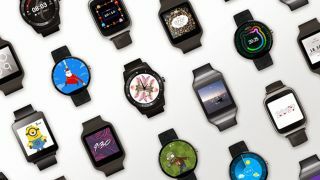 Each Android Wear smartwatch ships with a selection of watchfaces out of the box, and you can access these directly from the watch by pressing and holding on the screen until you feel it vibrate, and scrolling horizontally to find a design you like. If you don't like included watchfaces, you can download dozens more through the App Store. Open the Android Wear app on your smartphone, tap on the 'More' button next to Watch faces at the top, and scroll to the bottom to see the 'Get more watch faces' button to launch the watch face section on the Google Play store. You can also create your own watchface by tapping on the 'My design' watchface and then tapping again on the settings icon. The notifications that appear on your smartwatch mirror the ones that appear on your smartphone. If you want to prevent certain apps from sending notifications to your smartwatch, go to the settings icon in the top right on Android Wear and tap on Block app notifications. From here, add the apps you don't want notifications from. By default, the latest notifications will appear as a card on the bottom of your screen. To open the notification, swipe up from the card and then swipe left to see the full notification. Keep swiping left to see the options you have of dealing with it. One of the options for messages and emails is 'Reply'. This lets you use your voice to dictate a message. You can also draw an emoji or pick from a selection of canned phrases. Like notifications, apps on your Android Wear smartwatch are mirrored from your smartphone. In other words, if there are matching smartwatch apps for anything installed on your phone, they will automatically be installed. You may, however, decide to install apps on your smartphone specifically because it has a handy smartwatch equivalent. You can find good apps to install by going to Android Wear and tapping on the 'More' button next to Essential watch apps. Google Now Voice commands enable you to do a variety of tasks simply by stating them in plain English. While the smartwatch is active, say 'OK Google', and you'll be able to do everything from asking about the weather and checking when your next meeting is to asking for directions to the nearest Chinese restaurant and calling your mum. Android Wear 4.4.2 added support for playing music directly off your smartwatch. To set this up, make sure you have the latest version of Play Music on your smartphone by going into the Play Store, switching to the My Apps tab, and tapping 'Update all'. Next, go to the Play Music app on your smartphone, go to Settings and tick the 'Download to Android Wear' box. If you have music purchased outside of Play Music, you may need to upload them to the Play Music service and download them back to your device for this to work. Once the music has transferred, pair Bluetooth headphones to your smartwatch for smartphone-free music playback. To do this, put your Bluetooth headphones into discoverable mode, then go to Settings > Bluetooth devices on your smartwatch, find the name of your headphones in the list, and complete the pairing process.